The estate Syrah typically exhibits a broad spectrum of black, blue and red fruits, dried herbs and jasmine, fennel, smoked meats and crushed rock along with very fine tannins, great length, balance and complexity. Including just a splash of Viognier, the 2014 Estate Syrah from Force Majeure is a killer effort that possesses uncommon purity and finesse paired with serious depth and richness. Giving up notes of pure black currants, blueberries, graphite, violets and hints of peppery meats, it hits the palate with full-bodied richness, a layered, seamless texture, integrated acidity and fine tannin. 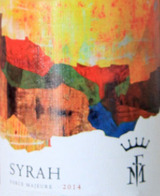 Give this incredible Syrah 2-3 years of bottle age and enjoy over the following decade. Is this the SQN of Washington?